The Ghirardelli Chocolate Company is a United States division of Swiss candymaker Lindt & Sprüngli. The company was founded by and is named after Italian chocolatier Domingo Ghirardelli, who, after working in South America, moved to California. 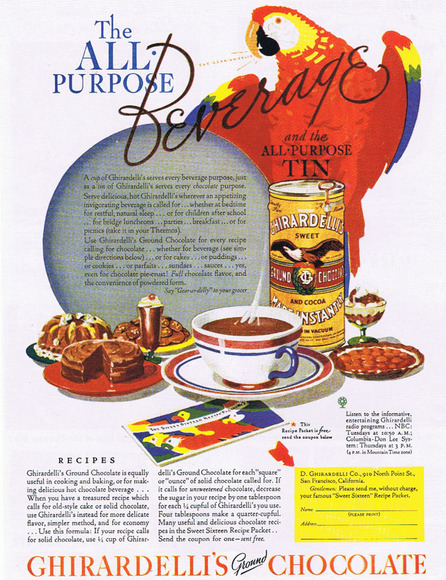 The Ghirardelli Chocolate Company was incorporated in 1852, and is the second-oldest chocolate company in the United States, after Baker's Chocolate. The correct spelling and pronunciation of the Italian name "Ghirardelli" has long stumped even the most avid consumers of Ghirardelli Chocolate. Domingo Ghirardelli, the founder of Ghirardelli Chocolate Company, must have resigned himself to the fact that only by a miracle was anybody going to get his name right: the original name of the chocolate company when it opened for business in 1852 was "Ghirardely & Girard." The spelling of the name Ghirardelli may have been an early attempt to indicate the correct pronunciation. Throughout its early history, the company has had to cope with all this and even incorporated it into early packaging labels and advertising campaigns. For many years, a bright colored parrot and the words, "Say Gear-ar-delly" (a phonetic spelling of the name) were used to help solve the pronunciation problem. The strategy proved to be very successful.